Engineering preparation. This phase starts with fine field alignment and building of mounds (project implementation for vertical planning) and straightening of troubled terrains (landslides, steeps, etc.). Grassing with grass mixture, field turf or hydro seeds. The process of planting can be done almost all year-round, excluding the winter season when the temperature is below freezing. The plants must be grown in containers. When there is a bare root planting, there should be taken into consideration the fact that the plants are not strengthened and should not be left out of the ground for too long. A hole should be dig with width at least four fingers and height deeper than the container in which the plant has been grown. At the bottom of the hole is placed a mixture of burnt manure, sand and loose soil. After the process of planting, the soul should be stamped down nicely and then watered plenty. In the next couple of weeks the watering should be regular to ensure the rooting of the plants. The process of sowing the seeds must be very delicate. It should be carried out in large pots or boxes. The soil must be fine, loose and able to strain off any excess liquids, such as water. If the soil holds liquids, the seeds might start rotting. The seeds are sown into depth twice their size. The small seeds can be mixed with sand which eases the sowing process. It is crucial for the containers planted with seed to be placed in a warm and bright location which is protected from direct contact with sunlight. The watering process should also be handled very carefully, protecting the seeds. We choose the grass mixtures following the specific requirements of the fields – exposure, soil type, etc. We use only mixtures with guaranteed germination and quality certificate. 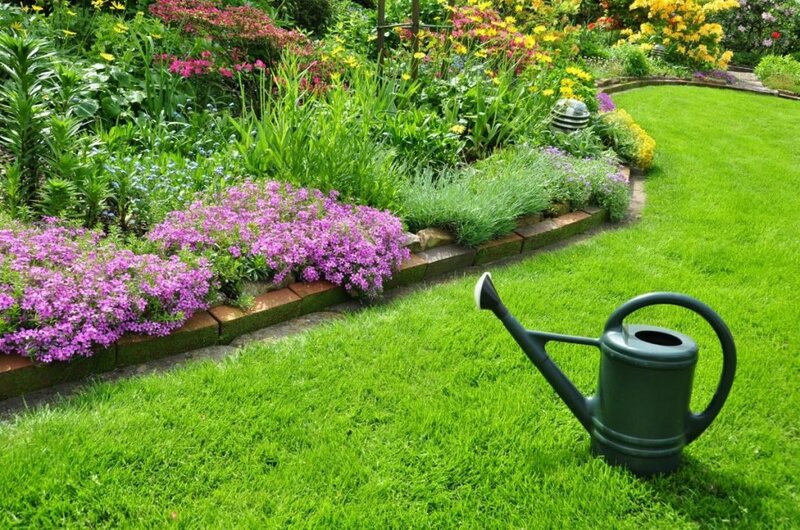 The best time for creating new lawns are the spring and autumn seasons, when the weather and soil conditions are most favorable. Our service “First Support” includes the first mowing and is included in the bid proposal for the construction project of each site. This way we guarantee that the grass that has been planted by us will have good growth and will look nice. Fertilization of the new sown grass is required. The grass sod is a type of grass, grown before the planting process. This enables the landscape experts to immediately develop all types of lawns. This is a modern and very safe product that quickly and seamlessly finishes all types of grass terrains. The grass sod can be laid throughout the whole year with the exception of the months with very high or very low temperatures. One of its main features and advantages is that it allows the development of the grass terrain at a time when the weather conditions don’t allow any drilling. The hydroseeding system is the only system which allows the successful grass implementation under a certain environmental conditions without any pre-treatment of the soil. From an economical perspective the hydroseeding system is the most lucrative investment. This is because a few processes are being carried out – simultaneously seeding, fertilization and irrigation. This method is the perfect solution for treating sterility problems of the soil, slow germination and difficulty of planting in critical periods. The contents of the mixture and the quantity per sq.m. depend on the overall environmental conditions where the implementation will be executed. The planting of seasonal flowers creates a wonderful decorative effect in the green area. It brings diversity and is replaced each season. The planting technology of color plants is different only for the bulbous flower species, as they are planted in the soil a season earlier. They should spend the winter under the snow, covered in the warmth of the soil. Then starts the germination process. The seasonal flower planting is often and commonly used to build a colored grounds and figures, as well as creating a decorative effects in the representative parts of the sites. This type of paths are the most commonly preferred. As the opposed to concrete pavement, the grass strip paths blend well with the surrounding landscape. They have a variety of forms and do not cut the green area, but discreetly pass through it. It is easy to get the effect that the client or the expert are seeking for. They are blending well with the surrounding or the opposite – are he accent of the green lawn. The green grass parking lot type is increasingly used as a contemporary design solution. It has a variety of features, including great functionality and practicality. As an added bonus is the great decorative effect as a finishing touch. This type of flooring does not have a typical displacement, detachment or sunken parking units. It is widely preferred because of its ability to be placed on steep slopes. That way it protects the surface from landslides and soil erosion, overcoming steep gradients. The “TH Consulting” Ltd. teams of professionals have vast experience in executing all activities, related to the overall development of a green area. We strive to perform these activities as part of the landscaping. We believe that the initial and main concept consists of combination between construction and landscaping. Our aim is to recreate the idea into execution achieved by professional methods and exceptionally high quality materials.